Metroidvanias are hugely popular these days, from the Xbox 360’s Shadow Complex and even Dark Souls, obviously going back to Metroid itself (especially Super Metroid) and some of the later Castlevania games. More recent titles like Guacamelee, Salt & Sanctuary and the forthcoming Bloodstained show that the formula is still going strong. 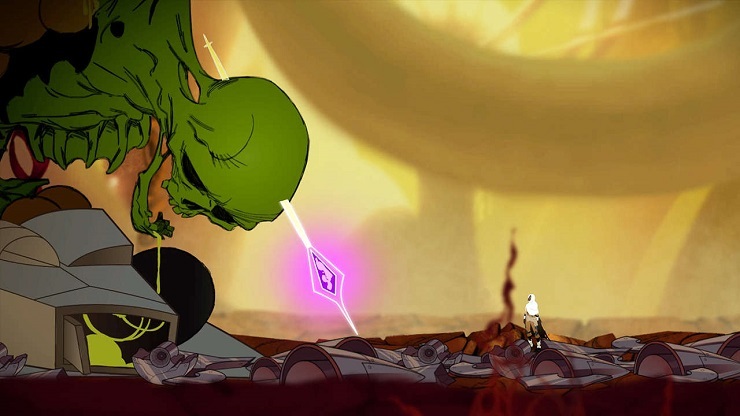 Along comes Thunder Lotus Games, maker of 2015’s Jotun, with its own take on the genre: Sundered. 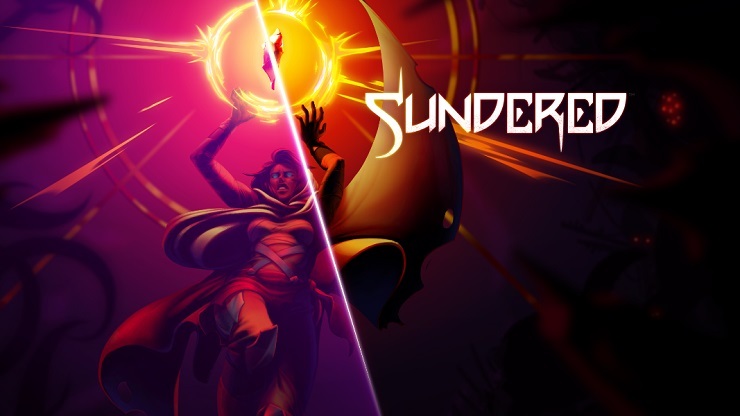 Bringing the same hand-drawn visual style as its last title, coupled with stunningly fluid animation and epic scale, Sundered is a beautiful game to behold. From its sandstormy opening and your character, Eshe, getting herself into some mischief, the artwork and effects mix beautifully to make it look like an animated film akin to Titan AE or some of the edgier Disney stuff. But there’s an undercurrent of brutality here, one that will challenge many players’ sanity. It was no accident that I mentioned Dark Souls a moment ago, because this game is bloody difficult. I know it’s the “in thing” to mention FromSoftware’s series when a game is hard though, and what makes Dark Souls playable is death usually comes as a result of the player’s mistake. Not so in Sundered, unfortunately. Remember in Left 4 Dead when a sound would indicate that a horde was about to descend upon you and your fellow survivors? There’s a similar mechanic here; each area has its own unique alarm that indicates a horde of enemies is incoming and you may as well resign yourself to death right then and there, as enemies literally swarm over you. Despite its decent combat, the first few hours of the game is akin to bashing your head against a brick wall. Except you’ll constantly respawn after you smash your skull and die. Eventually you’ll break through the wall and continue, before running head first into another wall. Because you will die a lot in those opening hours, usually as the dynamic, random encounters will occur at the worst possible times, and when the hordes arrive they will overrun you. You can’t flee from a horde if things get hairy either, because the swarms of enemies will chase you to the ends of the earth.The game even tells you “there is no escape” in the loading screens that you’ll have to get used to seeing. I’m going to mention FromSoftware again here, because Sundered’s painfully long loading times reminded me of watching Bloodborne’s boring, pre-patch load screens for several minutes after every death. In a game this size, the initial load will always be quite long and that is to be expected, but each death resulted in waits of over a minute and a half. Like Bloodborne though, there is room for post-launch improvement, so hopefully Thunder Lotus will reduce those times dramatically. Another issue that requires attention is the constant lag pauses, because those can seriously mess up your current run. Sundered is regularly plagued by this instability, leaving poor Eshe incredibly vulnerable as she finds herself suddenly frozen in the middle of a fight, only for the action to resume half a second later with her face being eaten by some eldritch creature. You have no control over this and it can lose you valuable progress if you were already low on health at the time. At one point, the game turned to a stuttering slide show before crashing altogether – just one of several crashes during my playthrough. It should be said that Thunder Lotus Games has said that a patch will go out for launch addressing these issues, so hopefully the technical issues will be sorted. I know I’m painting a very bleak picture of this title, but the truth is, it’s actually a very good game beneath the layers of instability and death. There’s a hint of Rogue Legacy about Sundered, as each time you die the world shifts and changes. The general shape of the regions remain the same, but the rooms’ layouts and orientation change considerably. This means that no two playthroughs are the same. It also means that you constantly have to adapt and think on your feet as you navigate each area, especially when the threat of random enemy encounters is everpresent. These normal enemies are nice and all, but it’s the bosses that steal the limelight in Sundered. All of them are tough. There are minibosses that are dotted around each area, mostly appearing as larger versions of standard enemies, but with their own special moves and dealing a tonne of damage. Like Jotun however, the real bosses are astronomical in size, the camera pulling back to leave Eshe just a speck on-screen, facing off against foes the size of buildings. These beasties are unique in design, and every one of them will destroy you. No point in lying to you, they are bloody hard to beat, sometimes due to not being ready and sometimes because you really do need better reaction times. Sometimes you’ll just need to grind a bit, level up and come back later, ready for the fight. Combat consists of very few buttons, with Square taking up most of the responsibilities for attacking. Combining it with different directions will result in varied attacks and jumping offers even more variety in Eshe’s combat repertoire, too. Pressing Circle sees Eshe roll, which is used to evade monsters, but this takes up energy so you can’t just spam it and take advantage of invincibility frames. This energy does replenish itself after a brief wait though, much like the shield that protects our heroine from harm for a short time. Once it shatters though, any incoming attacks will drain her life bar and you only have a finite amount of health packs (you actually start with only one), leading to those inevitable deaths that I mentioned earlier. Death isn’t the end, however. Unlike the usual roguelike formula of many games these days, any XP gathered during a run will remain with you after death, allowing you to spend it on upgrades via the skill tree in the Sanctuary hub. The skill tree is huge, and it’s also the only way you can upgrade your armour, damage output and maximum life, etc. You can also upgrade the various abilities that you’ll collect along your journey which, in true Metroidvania style, allow you to reach previously unreachable areas. Every region is markedly different in Sundered. Whereas Jotun went for pure Norse style, the Valkyries of this new game’s world seem very unusual and their realm is a wonder to behold. It’s more sci-fi than you might imagine, but there are also more fantastical-looking areas and each one has its own fiendish gatherings of beasties and machines that want to tear you apart. The level design is spectacular too, both in terms of the stunning artwork and the layout of each map, especially taking into account the way it factors in the use of new abilities and teases those you haven’t yet found. Perhaps the most interesting part of the game is the corruption mechanic. When you pick up shards from beating bosses, or gather three pieces to create a whole one, you can choose to corrupt those shards to increase your power. This earns new abilities or morphs existing ones into more dangerous powers that can give you an extra edge over your enemies…at a price. The more you corrupt yourself, the more your sanity suffers, and you can find yourself battling additional, ghostly creatures as Eshe begins her descent into madness. You just have to decide whether the reward is worth the risk. This affects the path of the story, although the storytelling on offer is more environmental than in-your-face cinematic, much like the mother of the genre: Metroid. Intrigue is the name of the game here. 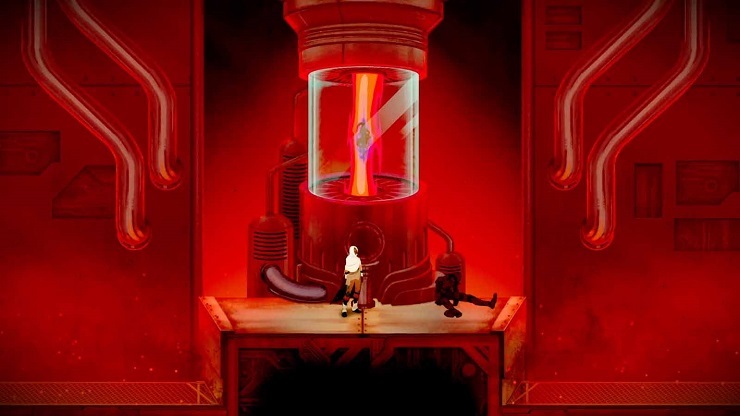 If it weren’t for the lag and the general performance issues, compounded by the frustration of the overly harsh difficulty of its opening hours, Sundered could have been up there with Symphony of the Night or Metroid Fusion. Instead, it’s merely a good Metroidvania with a unique and beautiful visual style. 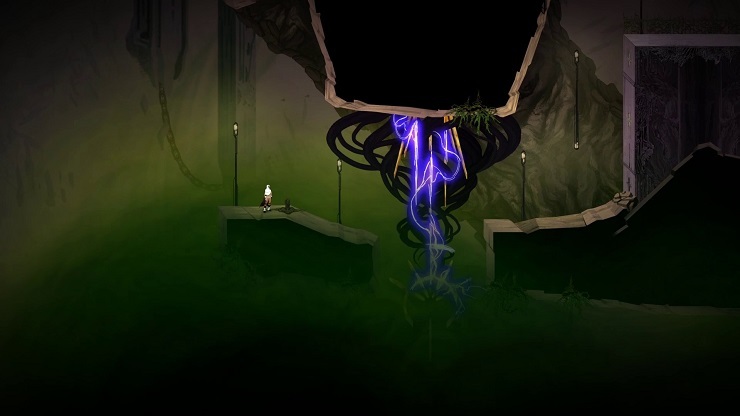 Sundered is a beautiful-looking Metroidvania with interesting mechanics, let down slightly by performance issues and a difficulty curve that is simply too steep during its opening hours.